For our second Nuts & Bolts post, I want to talk to you about Vanilla Extract. I will never understand why vanilla extract is sold in such tiny bottles. It is by far the most used of the extract family, and I personally go through a ton of it because I always up the vanilla quotient. What really frosts my cookies though? How much it costs. 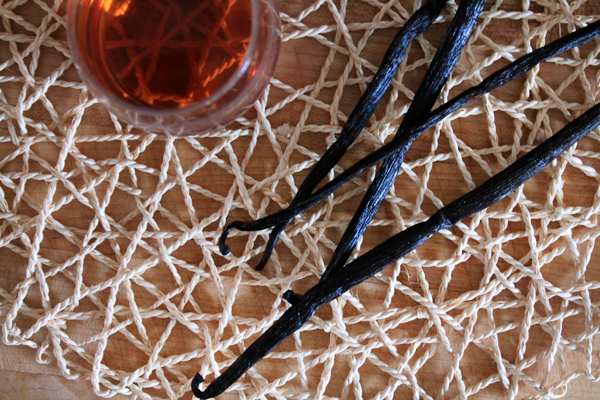 Real, honest to goodness, homemade vanilla extract is incredibly cheap to make. Average cost per tablespoon of homemade completely pure vanilla extract: 19-25 cents! All you need is the 2 ingredients and time. You can start using your homemade vanilla extract as soon as 6 weeks, but the longer it sits, the better it is. A lot of food bloggers out there suggest preparing a bottle of vanilla extract in time to give away for the holidays as homemade gifts. Now, I’m all for that, but I also see value in simply making a huge bottle of extract for yourself. Two years ago I made my first bottle of extract. I only just killed it. Value for money, I say! Using a sharp knife (a fish de-boning knife actually works wonders here), slice each vanilla bean pod open length-wise. Place the opened vanilla bean pods (6-8 per 750 ml, 10 per 1.75 litre) in the bottle. Replace the cap on the liquor bottle and place the bottle in a dark spot. Mine went at the back of my pantry, and a calendar item went into my phone for 6 weeks in the future to check on it. If you start out with vodka, the liquor should turn from clear to medium-dark brown in that 6 weeks time, and will get darker as time goes on. 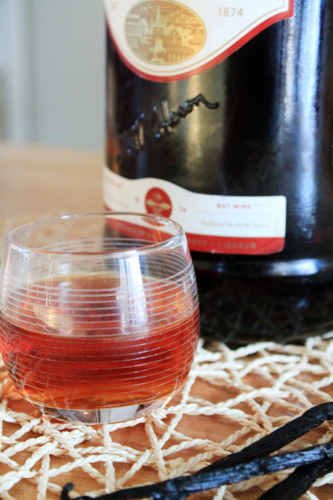 Bourbon and Southern Comfort don’t change much in color, but they do make some delicious vanilla extract. You will have tiny vanilla seeds in your extract as you use it. Don’t worry. This is perfectly normal, and in fact, improves the flavor of your recipe. How do you prepare your small bottles to finish the vanilla. Mine has been steeping for about 6 months and I need to get it ready for Christmas! YUM! And then, simply make sure that each bottle has a little bit of the vanilla pods in each, to keep the vanilla flavor renewing. Your recipients can keep adding vodka to renew the vanilla. I’ve been making vanilla since visiting Tahiti 10 years ago. Its the only FDA regulated spice and as I recall the ratio is surely higher than your recipe calls to get a good body. based on my notes (been 2 yrs since making a batch since I make a lot and sell it to friends in nice bottles with labels) . 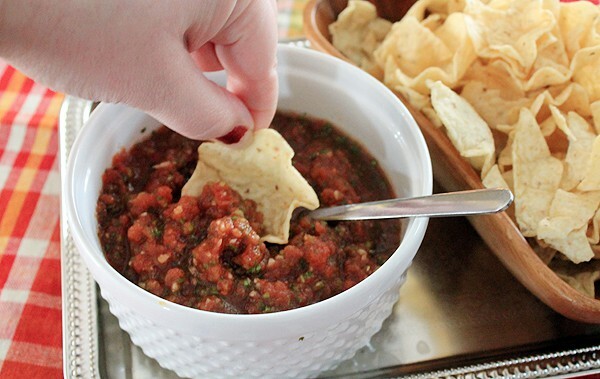 Its about one 7 inch bean per 1 oz (30ml) of a grain alcohol which is at least 35% alcohol. Of course this varies depending on the content of the bean and if you use bourbon or Tahitian. I prefer Tahitian which is milder but with a very nice flavor. I’ve tried different vodkas seeing if Rice grain, or other grains are better. no difference to me. Anyway. basically I do the 1-1.5 7inch beans per oz and let sit for 2-6 months and occasionally shake. I pretty much shake it every week and tip upside down in the jars. straining is a pain, have to do it like 3 times. Specialty bottle sells the bottles that are perfect for vanilla. All the recipes I’ve seen have suggested using 3 beans for every 8 oz of alcohol, which I do, AND I let mine sit for a minimum of 3 months. Basically, it doesn’t smell at ALL like alcohol when it’s ready to use and it’s DIVINE! I’ve tried it with both rum and vodka and I definitely prefer the vodka. I’ll have to try a small batch of southern comfort and see how that turns out! oh, so I just did the math. I use about 23 beans for every 1.75L bottle. That’s a ton of beans, I know, but it makes such a difference! 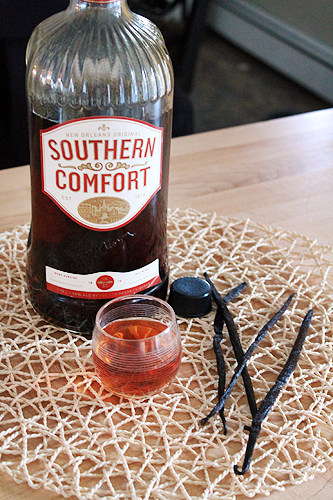 I’m never without a huge bottle of homemade vanilla extract – I definitely need to try it with Southern Comfort next time. 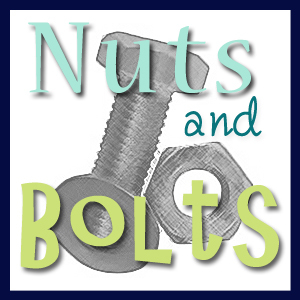 Great Nuts & Bolts post, my friend. Amber I made sooo much vanilla extract not that long ago and I’m getting ready to mail some bottles out to friends and family. I think its great that you can continue to add liquor to the bottle and keep making more extract as long as the beans stay in the bottle. Never ending supply of extract…woo-hoo! I used 4 different types of vodka, rum and bourbon. This is totally something everyone should know! I love making homemade extract. I made a huge batch 2 yrs and need to restock! I make mine with Shiner! LOL….just kidding. I make mine with Cognac. I make all my own vanilla extract from scratch, too! Love that you used Southern Comfort…will have to give that a try next. Wow – two years of use at the rate you use it… that’s a pretty good track record! And speaking of shots of bourbon, I think I might have to mosey over to the liquor cabinet now. It is Friday afternoon, after all. This seems so simple! And the value is phenomenal! My mom was thinking of making extract for Christmas gifts, like you said. I’ll definitely be forwarding it along! Love that you used southern comfort. I’ve been making mine with vodka and bourbon, but never thought of trying it with that. Thanks for the tip!